Character Buffet | Click on any image to view larger. 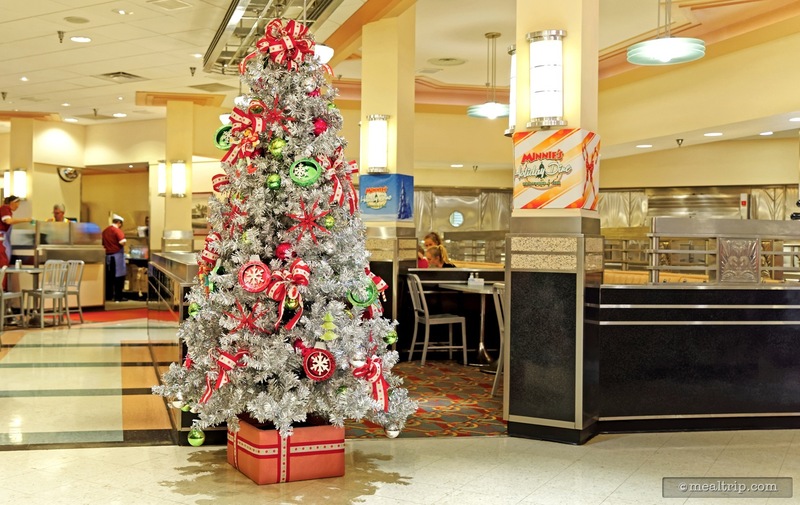 The Minnie's Holiday Dine at Hollywood and Vine listing is a Character Buffet dining location at Hollywood Studios featuring American cuisine. There are 53 photos in the Mealtrip photo gallery for this location and dining period. 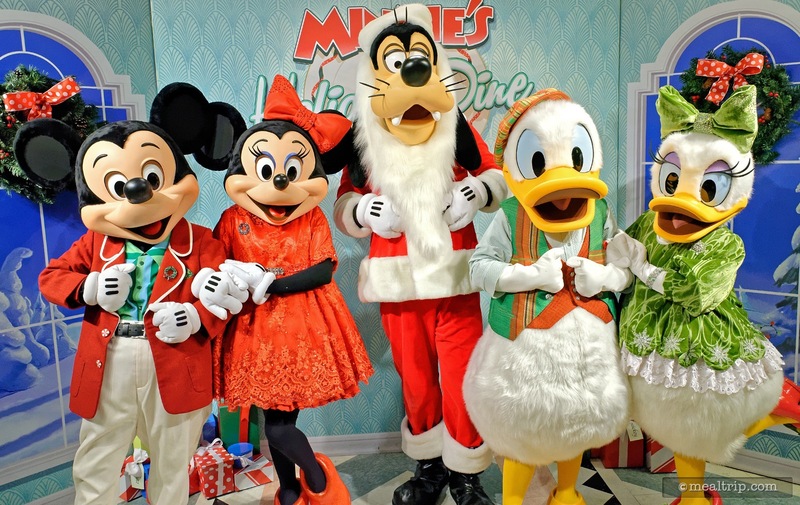 The Minnie's Holiday Dine at Hollywood and Vine listing currently has a score of 68 out of 100. 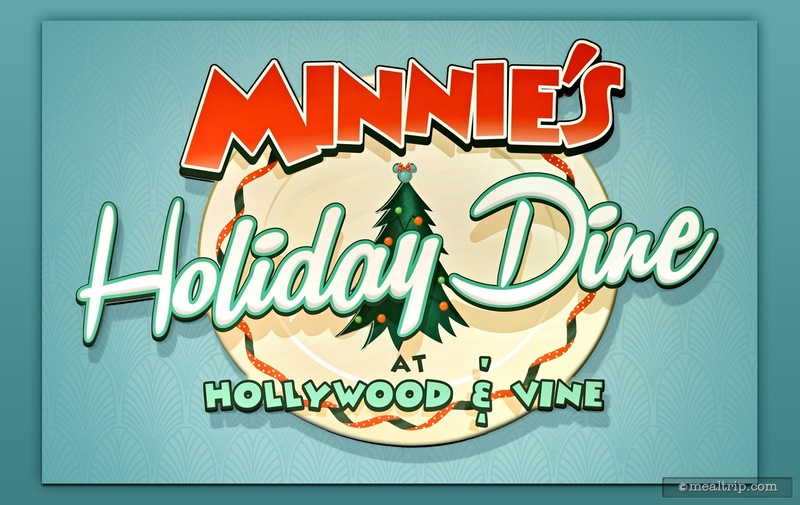 Click here to read all of the reviews for this location, or log in to Mealtrip.com to add your own review for Minnie's Holiday Dine at Hollywood and Vine. 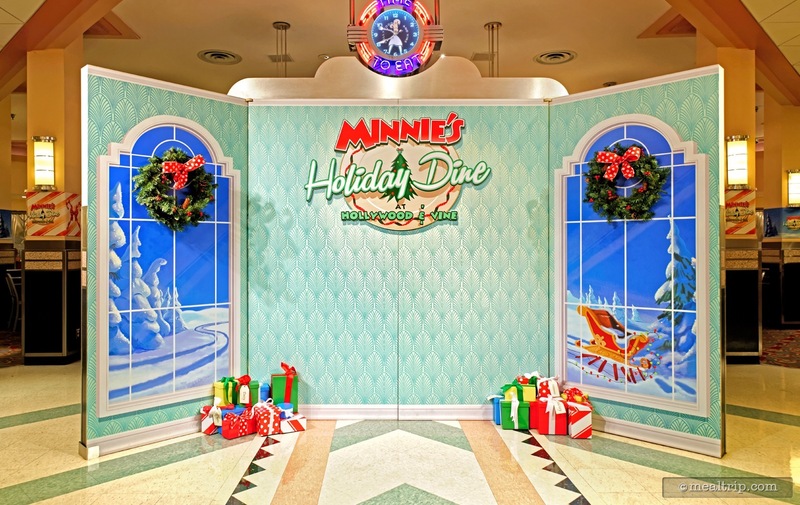 The Minnie's Holiday Dine at Hollywood and Vine logo can be found on the main photo backdrop. 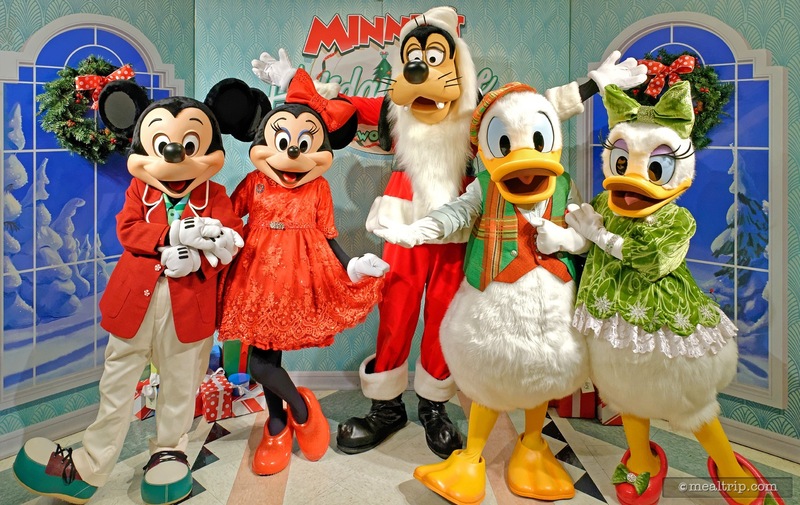 Mickey, Minnie, Santa Goofy, Donald, and Daisy are all dressed in their holiday finest at Minnie's Holiday Dine. This backdrop is the first thing you will encounter when entering Hollywood and Vine and is where you can grab a photo with Santa Goofy (character may change depending on the night). 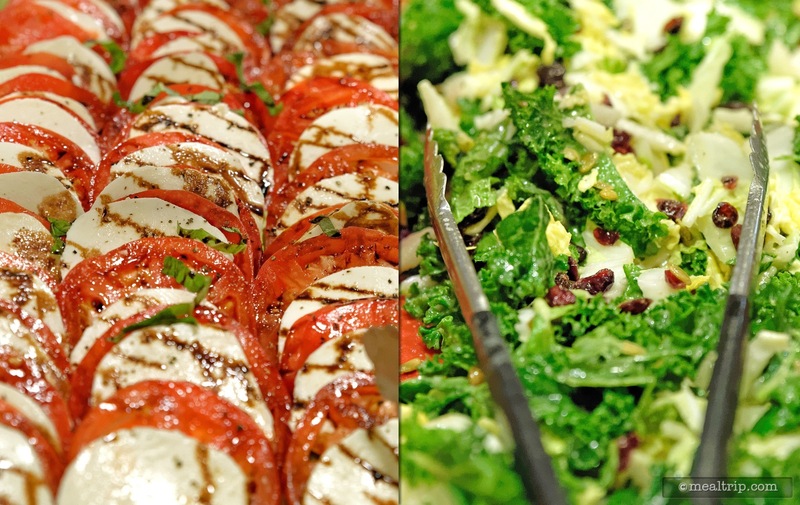 Insalata Caprese on the left and Winter Kale and Cabbage Salad with Pumpkin Seeds and Dried Craisins® on the right. 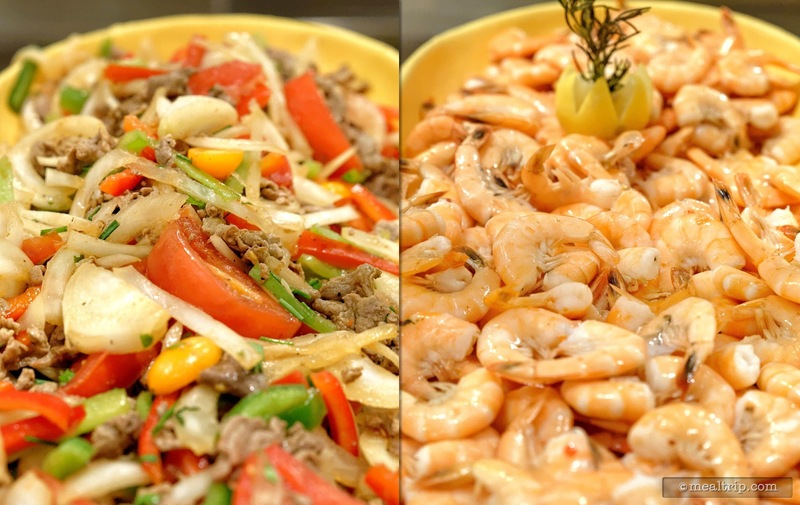 In the "prepared salads" section you will find the Beef Salad (left) and Shrimp and Cocktail Sauce (right). 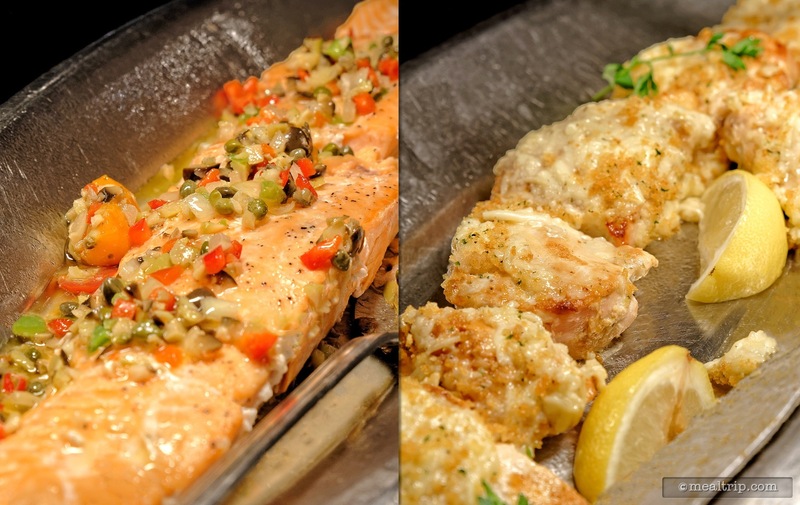 Hot line items include the Verlasso Salmon (shown here to the left, topped with capers, onion, and red pepper) and a guest favorite (which will probably remain year-round) the Asiago Ranch Chicken Breasts (right). 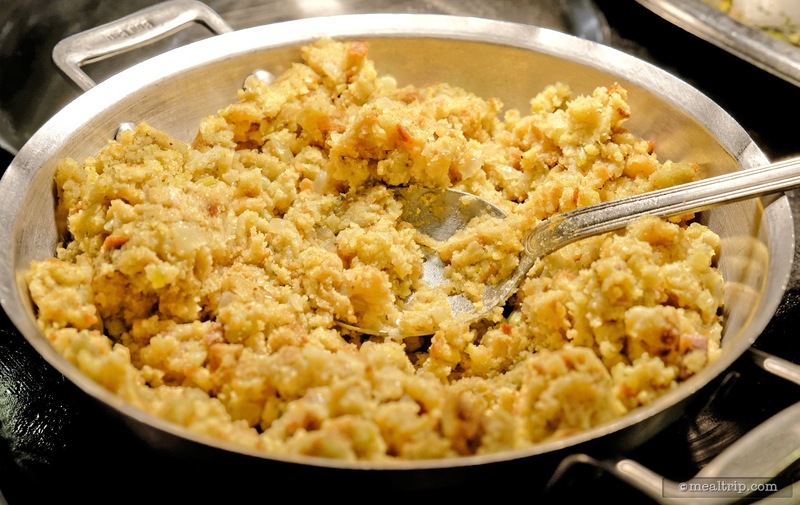 The Corn Bread Stuffing is probably specific to the "holiday" menu. 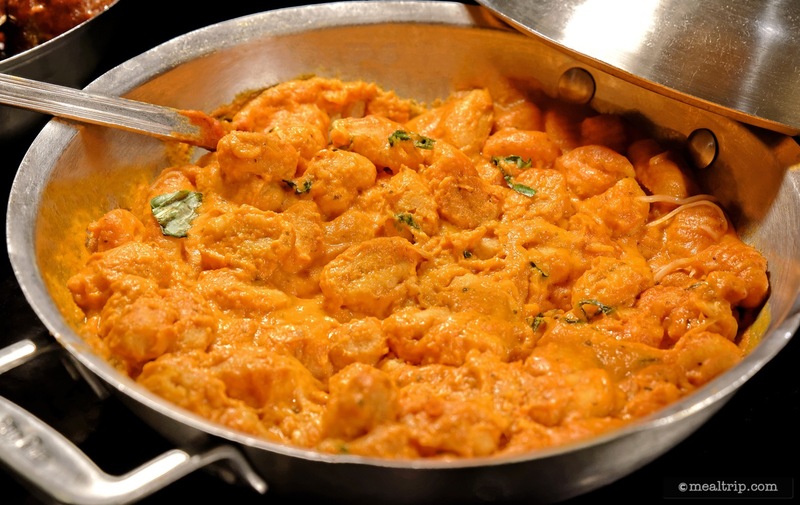 This Sweet Potato Casserole is new to the Holiday Dine menu. 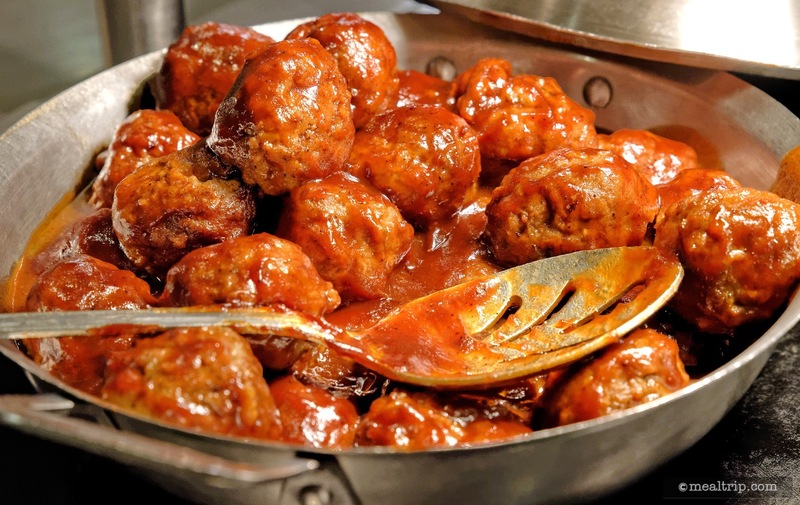 The Barbecued Meatballs are not very "holiday", but they are great meatballs, and have been a regular on the Hollywood and Vine menu for a while. 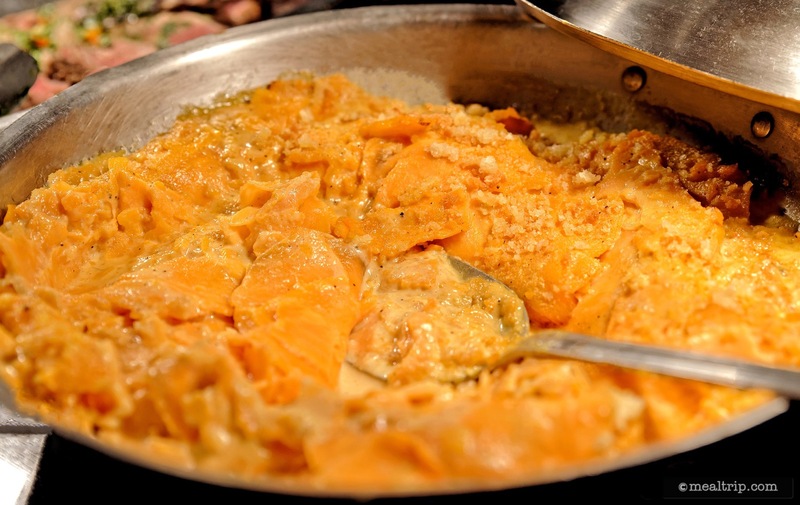 The Pumpkin Ravioli is a unique item, and definitely worth a try. 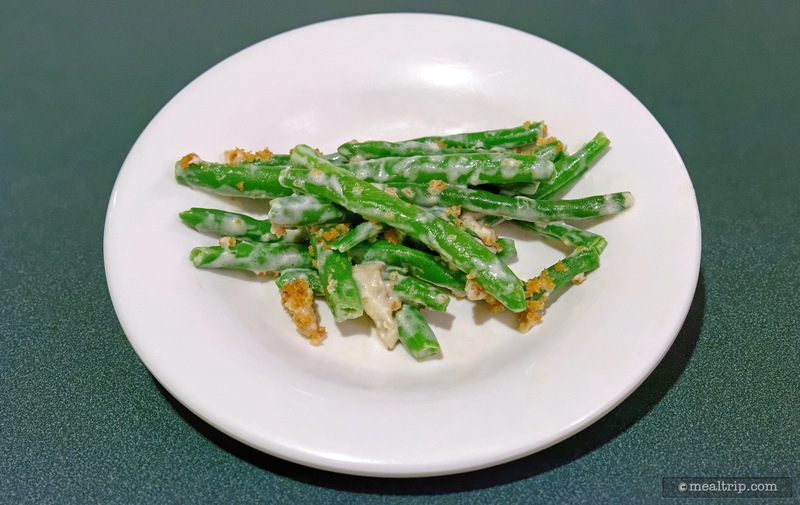 A holiday tradition for many, the Green Bean Casserole at Minnie's Holiday Dine is a welcome addition to the winter menu. The Marinated Flank Steak (left) may not look like much, but it was actually one of the highlights from the hot-line items section. 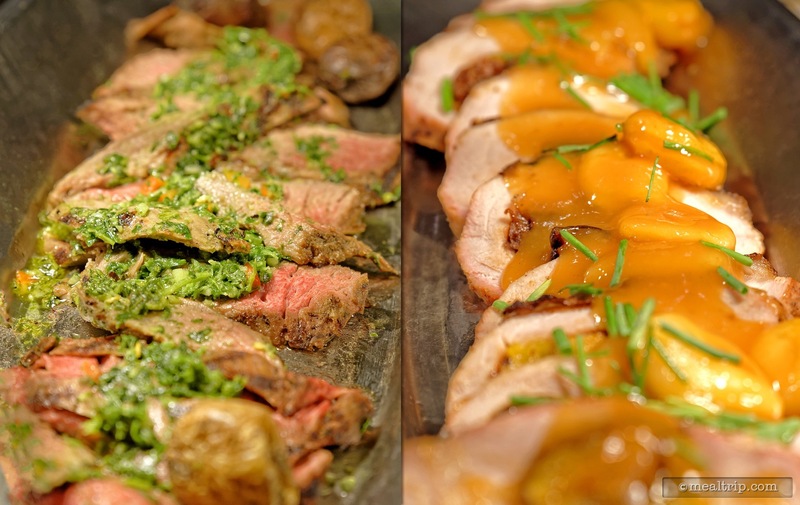 Also struggling with appearances, the Apricot Roasted Pork (right) is yummy... if you like apricots. 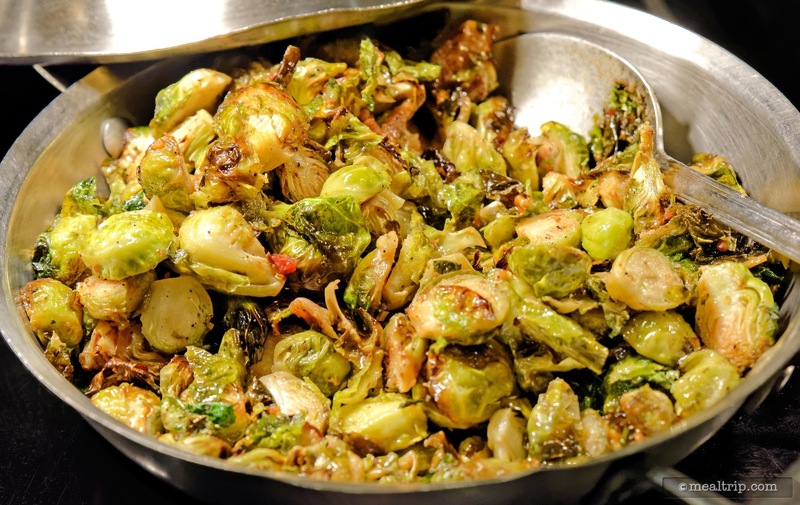 Mmmmm, Brussels Sprouts (the dark, caramelized bits are the best)... here again though, you really have to like Brussels Sprouts to enjoy this dish. Fortunately, I do. 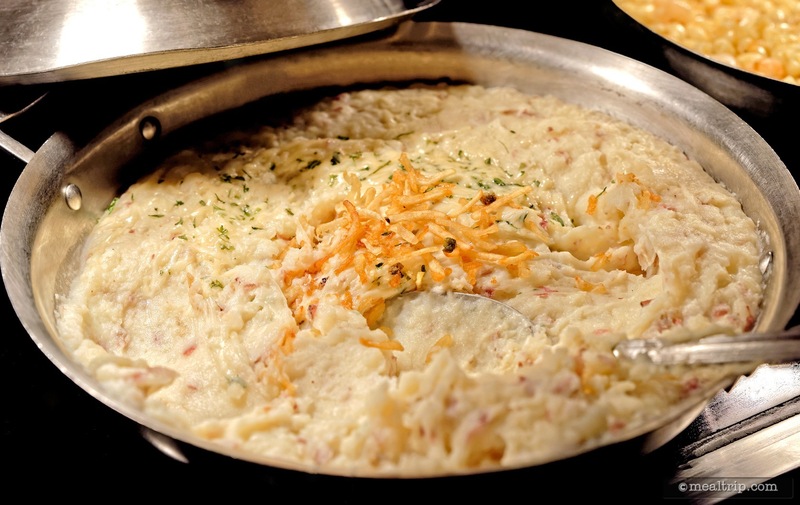 There is some gravy available for the Garlic Mashed Potatoes in a separate dish, but the potatoes are so good on their own, I didn't even try the gravy. I sure do which there were more of those crunch onion bits on top. 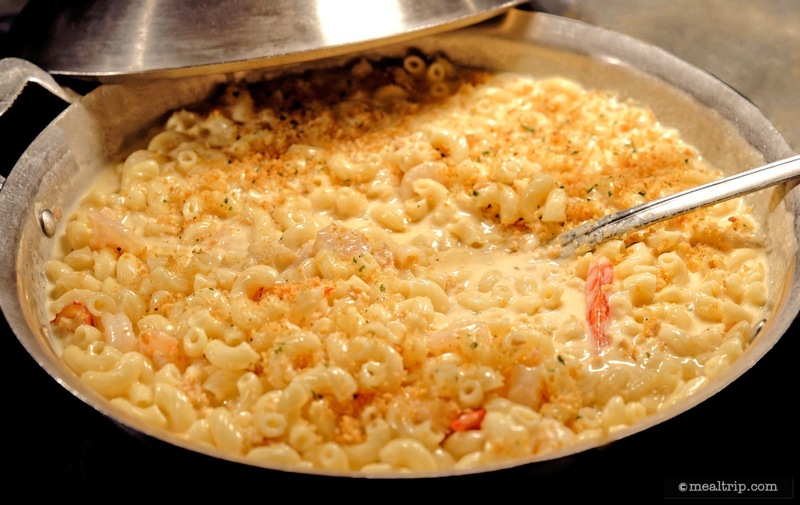 The Shrimp and Lobster Macaroni & Cheese is another one of those Hollywood and Vine favorites that will probably be on all of the seasonal menus... it is every bit as good as it sounds! 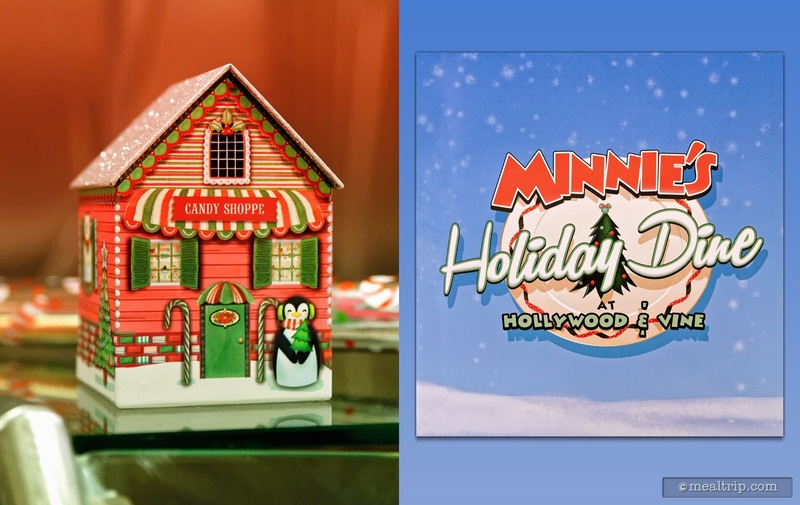 You will find small decorative elements around the room like this small "candy shop" tin house (left) from the buffet line (yes, it's glued down, so don't get any ideas) and the event logo, which is wrapped around just about every column in the main dining areas. 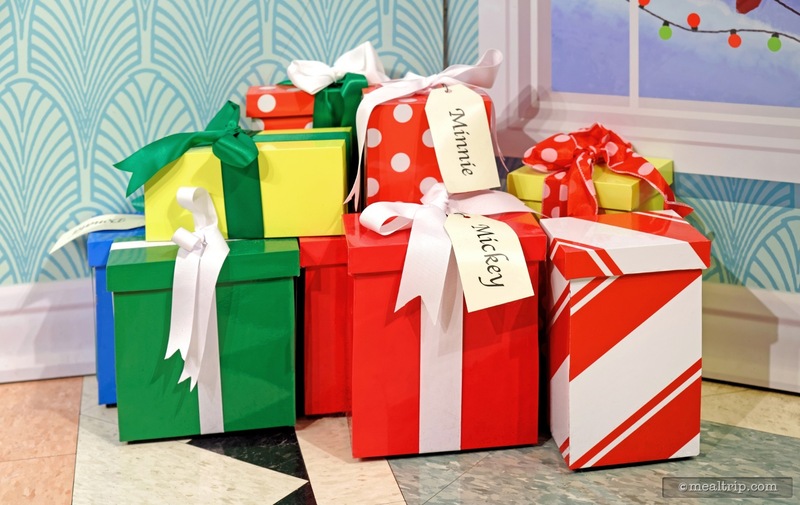 Holiday presents can be found on either side of the main photo backdrop. They are a bit too low to actually make it into the main photo, but it's the thought that counts. This silver tree seems like the perfect design choice for the "light art-deco meets cafe kitsch" feel at Hollywood and Vine. Even the food item labels are designed with holiday cheer! 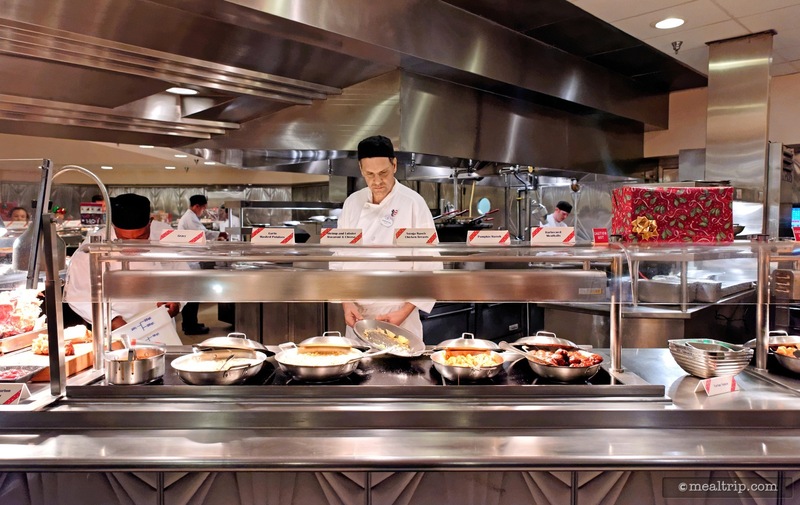 The on-stage kitchen at Hollywood and Vine is large, and helps to keep all the line-items fresh, because it's easy to see when something is running low. 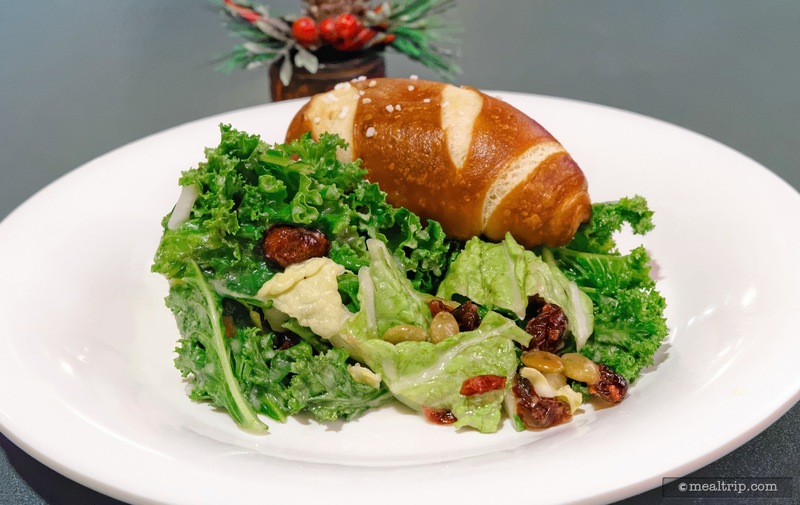 The Winter Kale and Cabbage Salad with Pumpkin Seeds and Dried Craisins® is new to the "Holiday Dine" menu, and is actually a great salad! I'm not sure how that pretzel roll got on there! 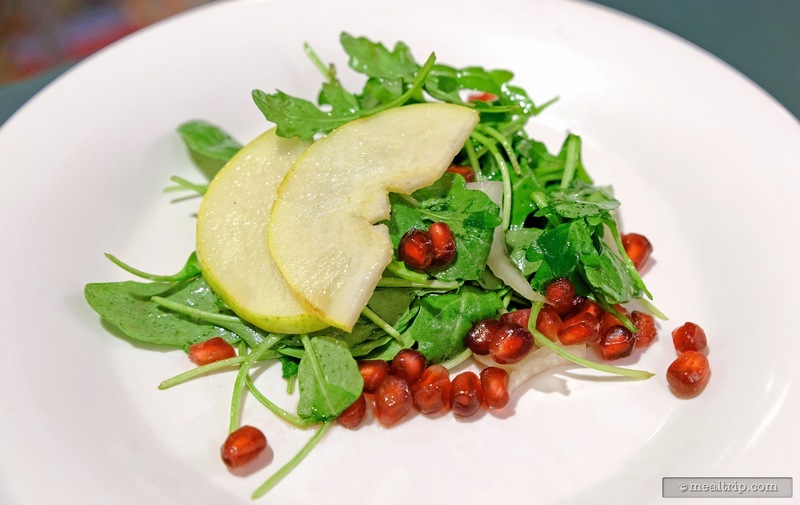 Another salad that is making it's first appearance on the "Holiday Dine" menu at Hollywood and Vine is the Pear and Pomegranate Salad with Shaved Fennel and Arugula. The Pomegranates are so very festive looking!!! 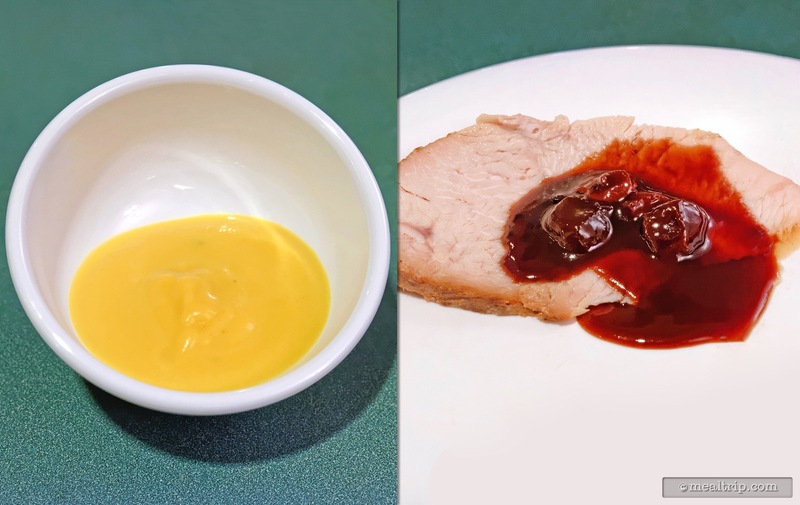 From opposite ends of the buffet line, a yummy bowl of Roasted Butternut Squash Soup (left) and from the carving station, a slice of Honey Bourbon Turkey with Cherry Port Sauce. 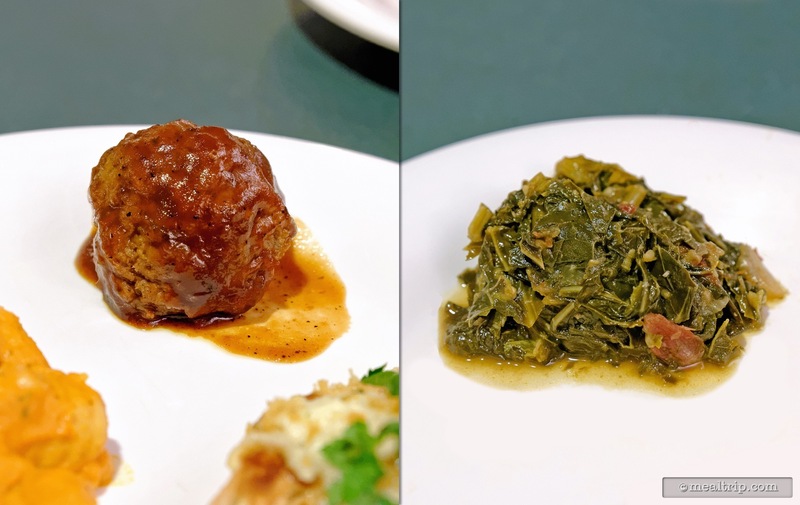 A lonely Barbecued Meatball (left) and a traditional southern dish Collard Greens (right) paired quite nicely with one another. 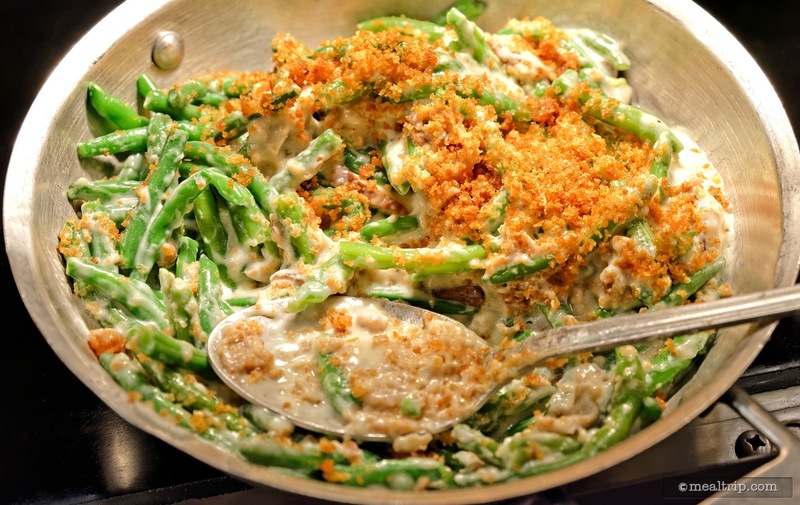 A holiday tradition for many the Green Bean Casserole has a mushroom sauce and crunchy onions on top... (although for me, the mushroom sauce was very light on flavor and added more texture than anything). The Marinated Flank Steak and Roasted Potatoes didn't look like much on the buffet line, but I'm so glad I plated this dish... it was one of my favorites of the night! 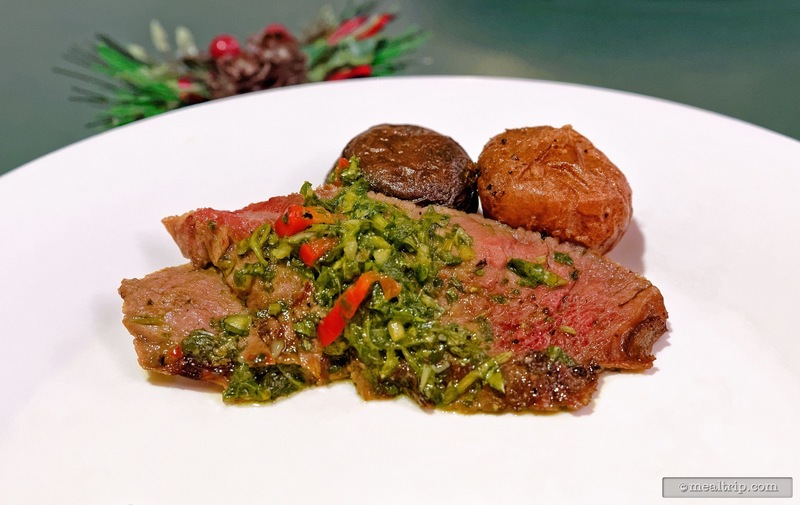 It probably has something to do with the chimichurri-like green topping. 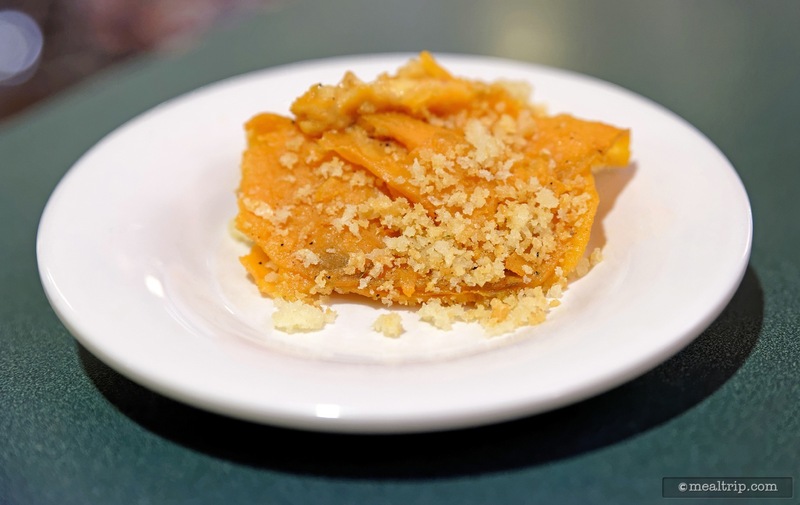 Even the thinly sliced Sweet Potato Casserole has crunchies on top! 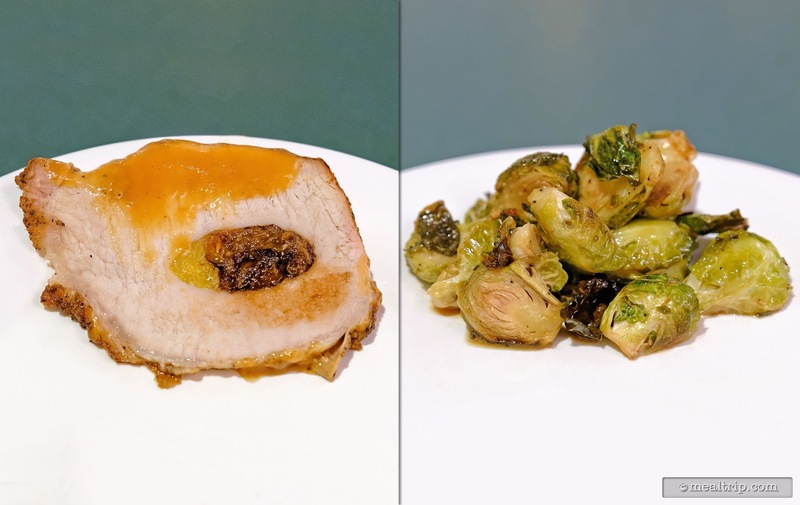 The Apricot Roasted Pork has a bit of an image problem. No one could figure out what that dark thing packed into the center was... which is too bad, because it was quite good... whatever it was. A pile of Brussels Sprouts is shown to the right. 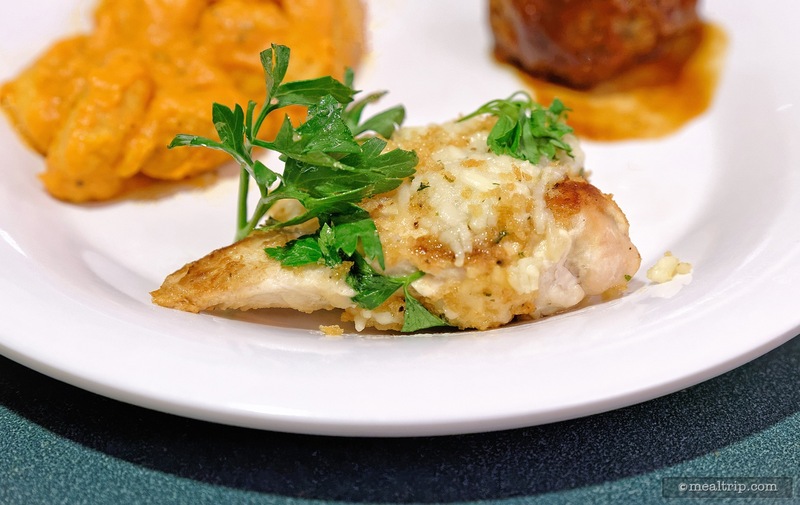 A close up of the Asiago Ranch Chicken Breast. 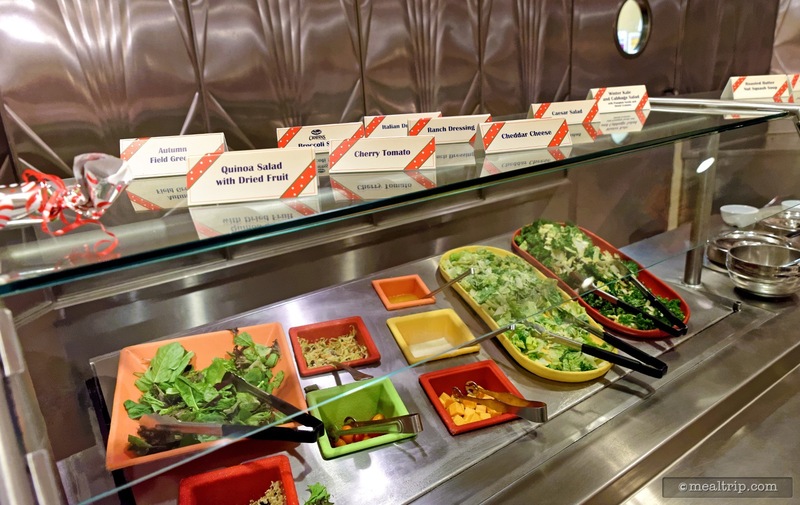 Helpful tip... make sure you get one of these right when they are refreshed on the buffet line. The chicken can sometimes get dried out under those heat lamps. 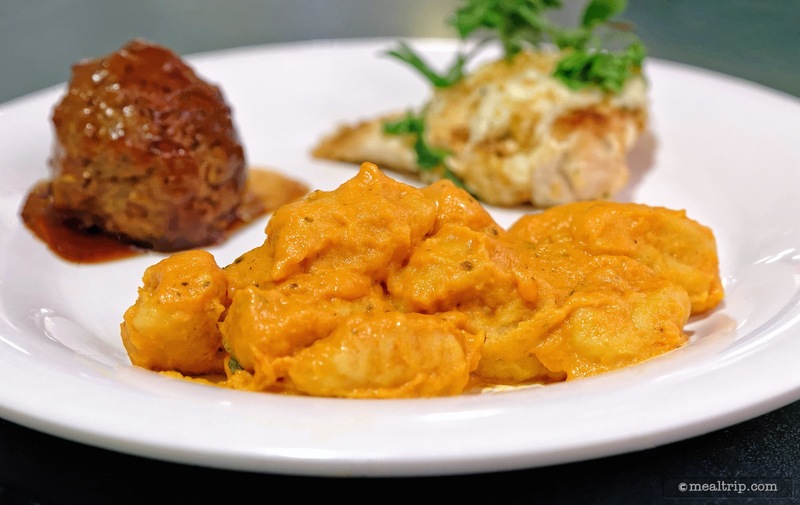 The Pumpkin Ravioli is a new addition to the Holiday Dine menu. Looks here, can be deceiving... while being pumpkiny, they also carried a bit of a heat (spices) which I thought was a great idea for this dish. 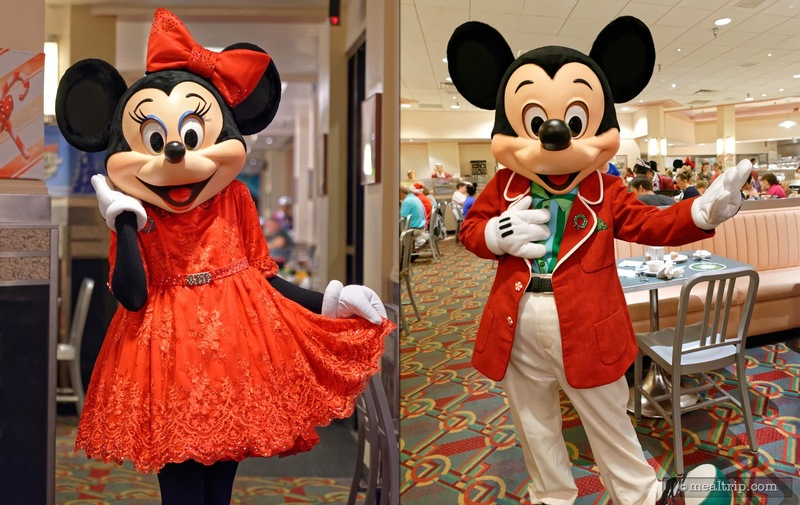 Minnie and Mickey work the room at Minnie's Holiday Dine at Hollywood and Vine. 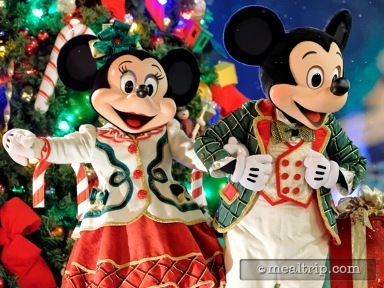 Mickey is looking particularly dapper in his red holiday jacket. Daisy and Donald also make their way around from table to table. 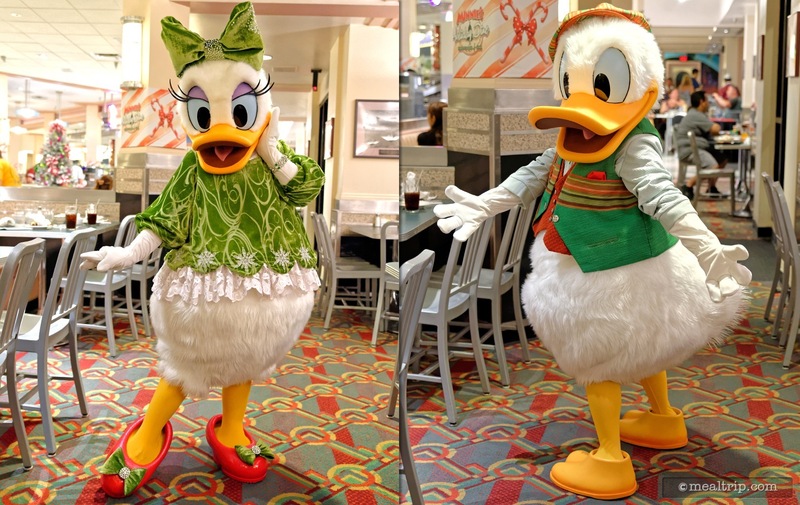 Donald seems to like his green holiday vest almost as much as Daisy likes her shoes! Santa Goofy (as far as we know) doesn't roam the room, and is only available for photos as you enter the dining area before you sit down. 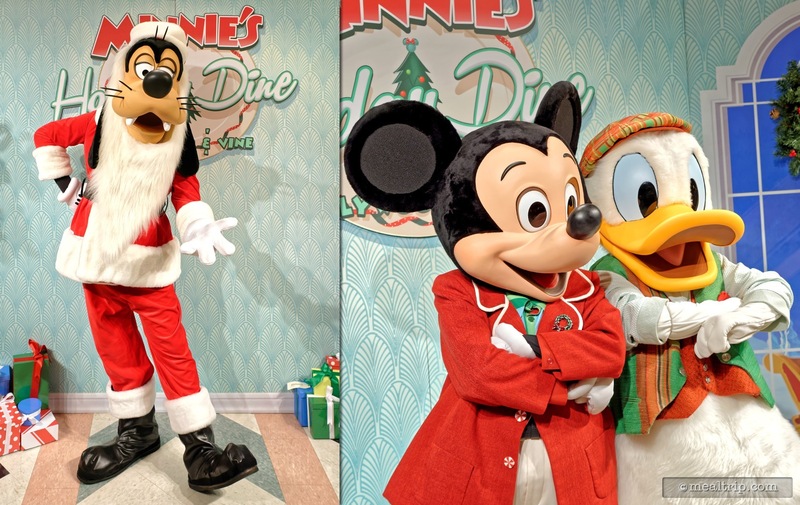 Mickey and Donald are striking a pose for the holidays. 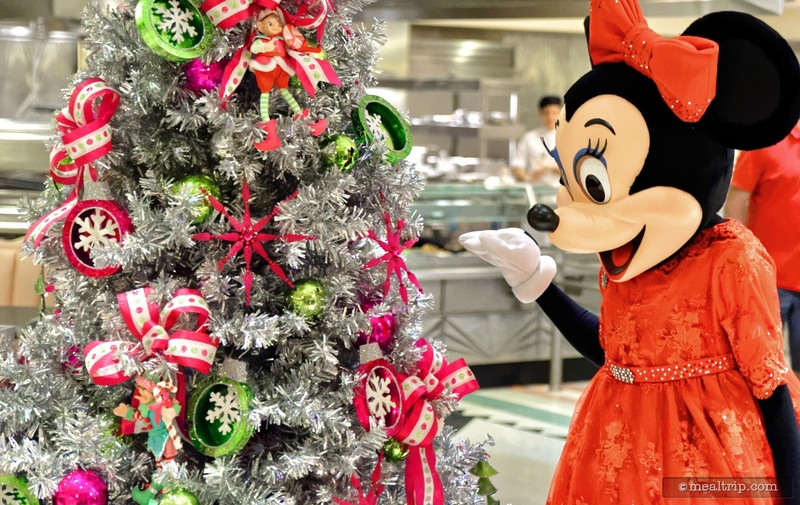 Always the gracious host, Minnie takes a second out of her busy schedule to spruce up the silver tree. 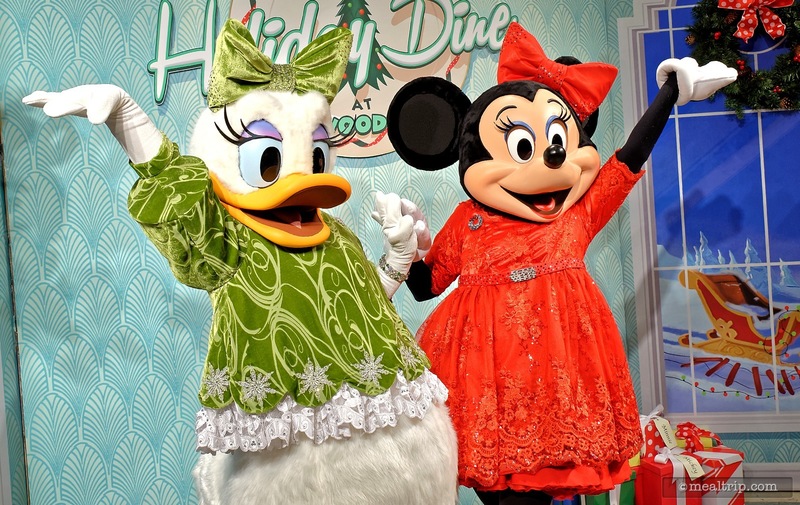 Daisy and Minnie show off their holiday outfits at Hollywood and Vine's Holiday Dine event. 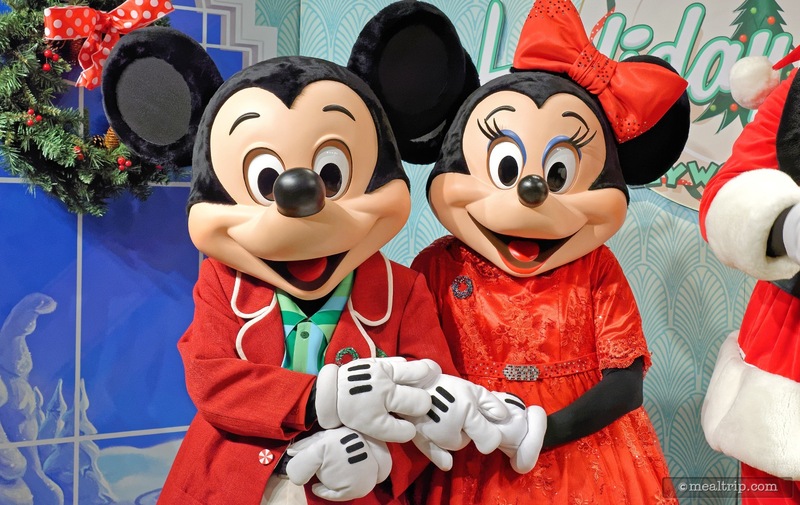 A picture perfect holiday card... Mickey and Minnie are just too adorable! 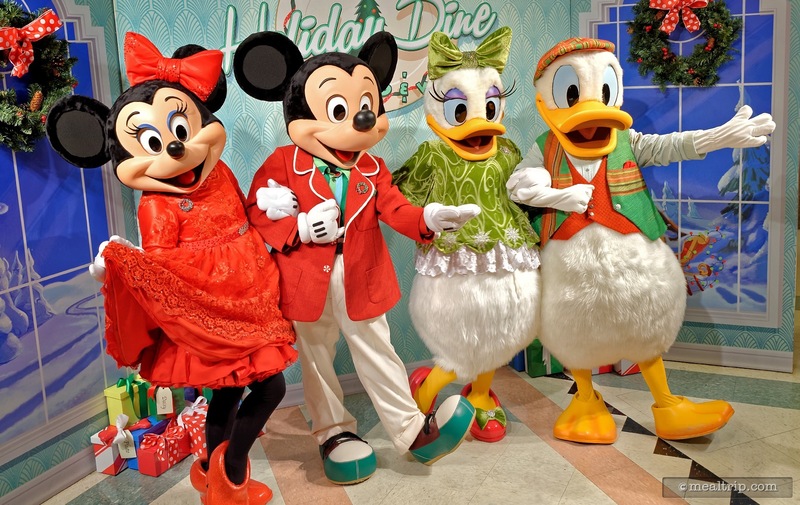 The "fab four" welcome guests to Minnie's Holiday Dine at Hollywood and Vine. 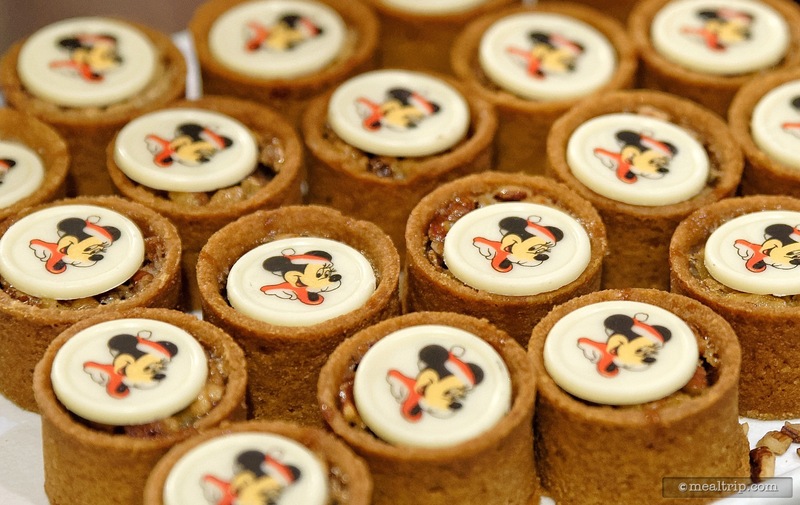 Mickey Pecan Tarts from the dessert station at Minnie's Holiday Dine at Hollywood and Vine. 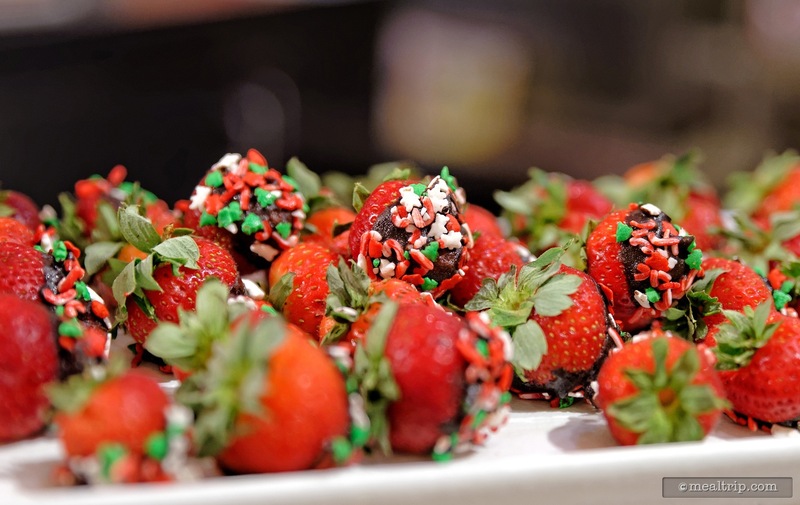 Even the Chocolate Dipped Strawberries get dressed up with tiny little Candy Cane pieces! 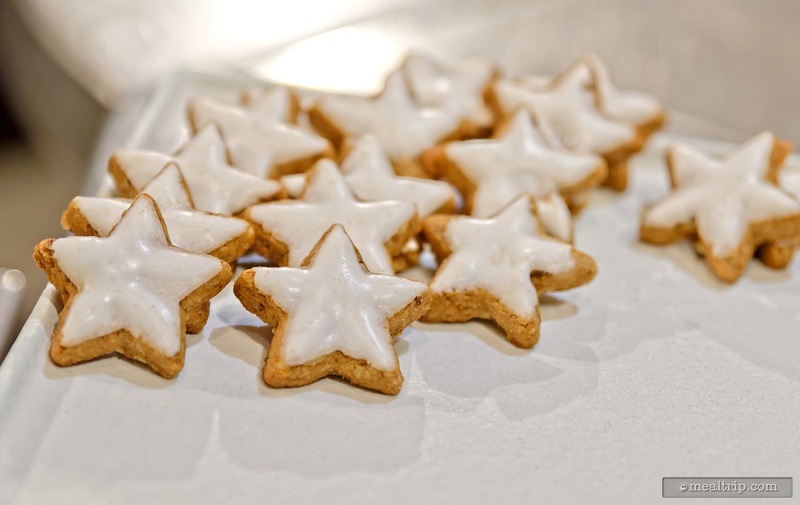 These are German Christmas Cookies from the dessert station at Minnie's Holiday Dine event. 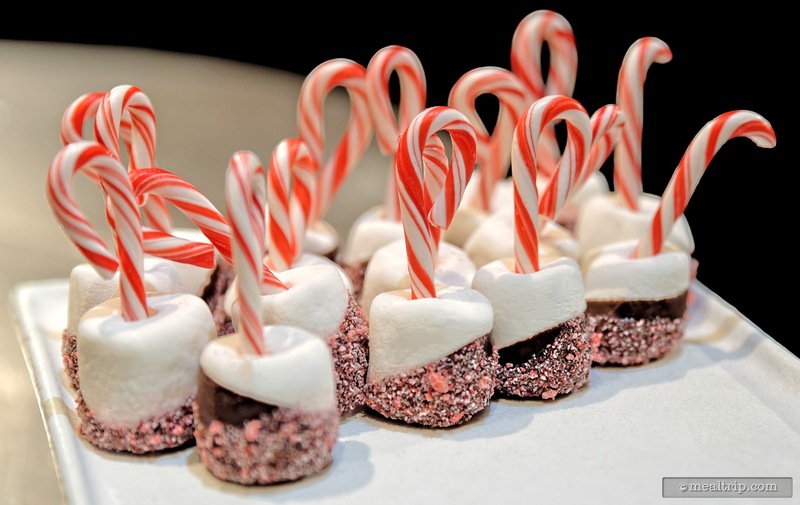 The Candy Cane Dipped Marshmallows are a fun idea (and made me wish I had a large cup of coffee to dip them in). 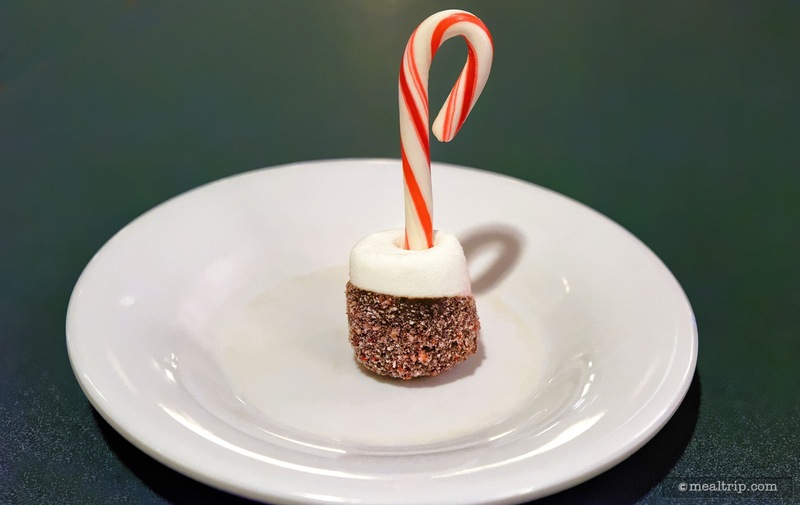 You can't know how difficult it was to get this one, single Candy Cane Marshmallow to stand up, all by itself, on that plate! 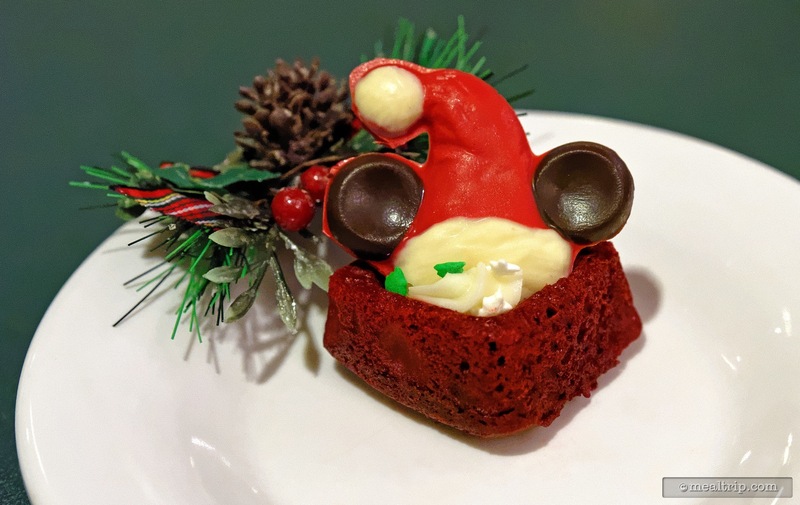 The Mickey Santa Hat Topped Red Velvet Cake was moist and yummy. 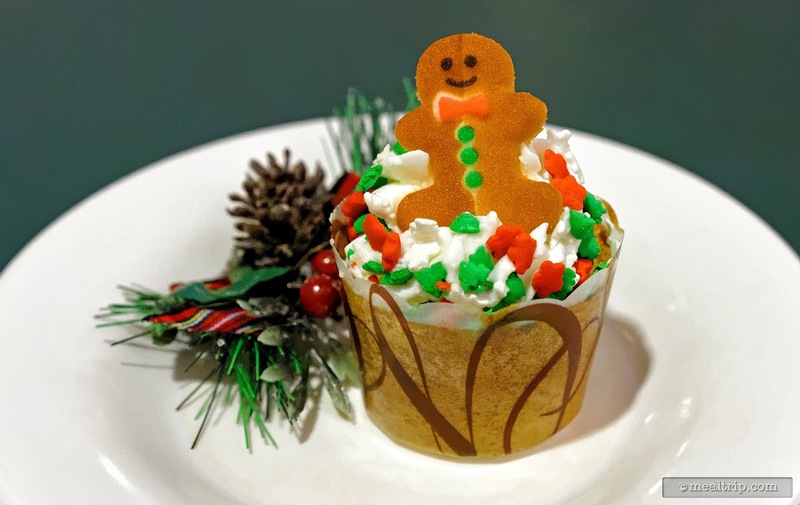 Awe... there's actually a tiny Gingerbread Man on top of my Gingerbread Cupcake! 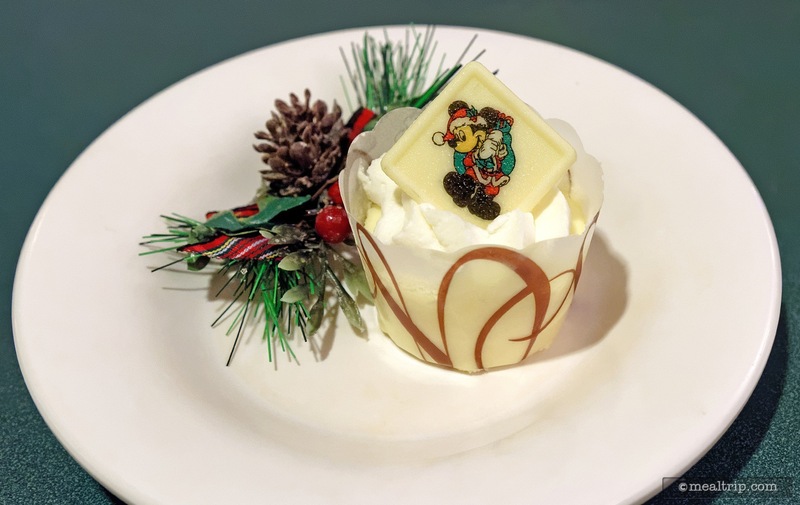 Minnie's Eggnog Cheesecake was actually quite good as well. It had a hint of that Eggnog flavor along with the cheesecake. 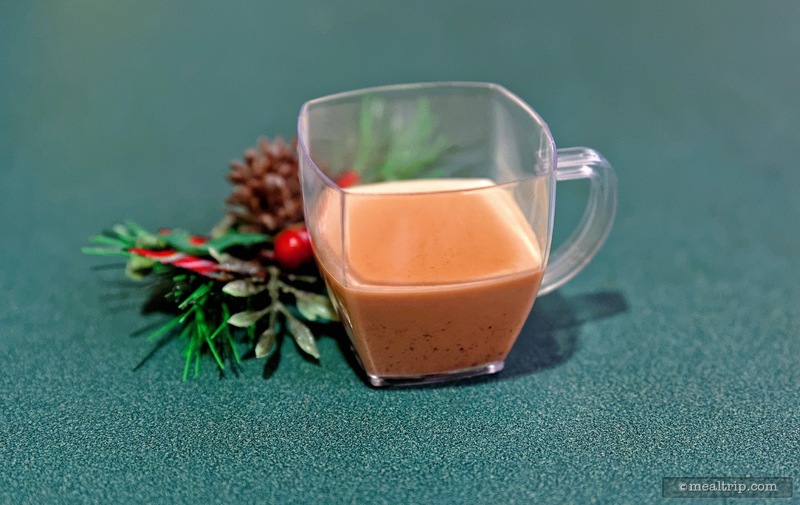 It was delicate, but you could distinctly taste the Eggnog. Pumpkin Tarts with Cinnamon Dust (and whip cream... and sprinkles), along with the Chocolate Peppermint Bark off to the right. 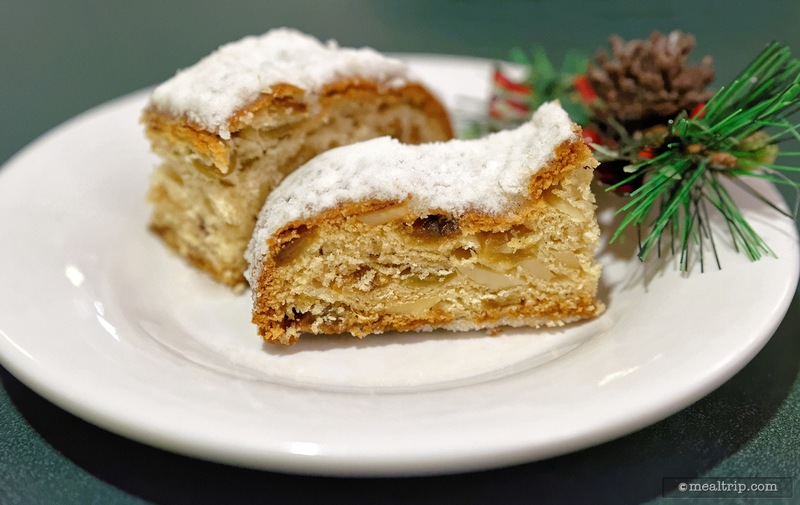 The Christmas Stollen here, is not quite as traditional as the Stollen you can find at Epcot's Germany Pavilion around the holidays. This Hollywood and Vine version was a little light on dried fruit, but was still quite good (especially when dipped in that spiced hot drinking chocolate). 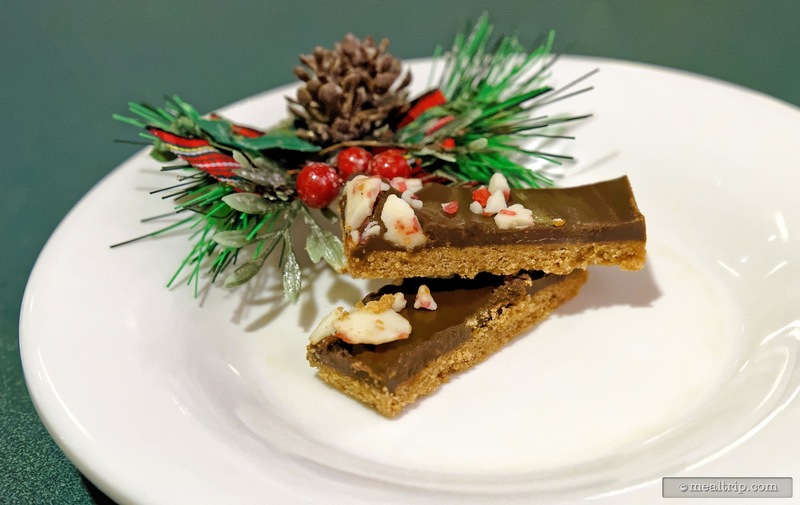 The Chocolate Peppermint Bark could have used a bit more of the candy cane topping (if you ask me), but was still a very welcome treat. 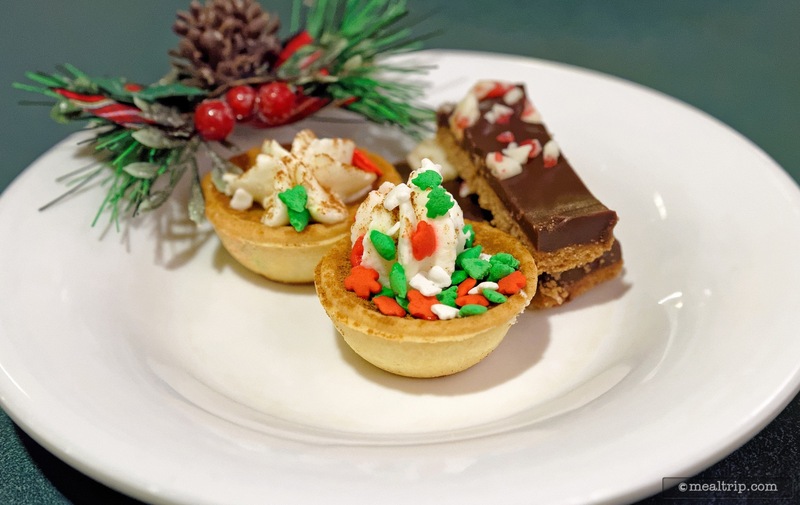 There are many small details around the dessert station. 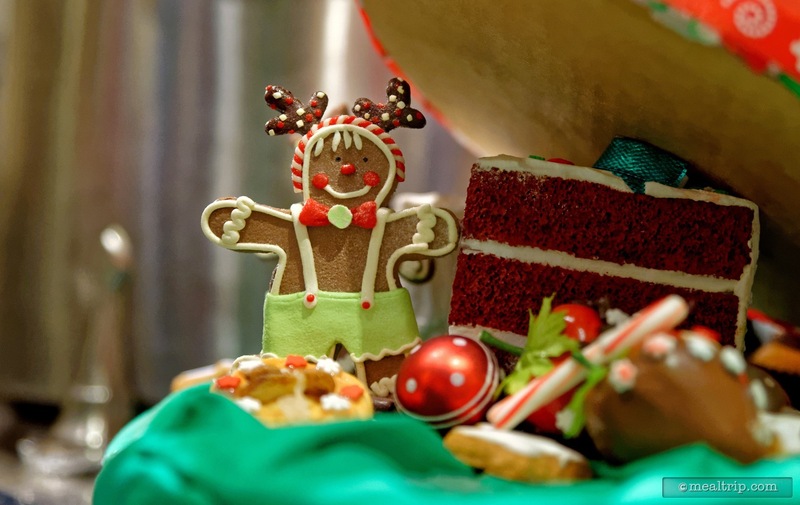 Under a giant cake centerpiece, you'll find this tiny, festive looking gingerbread man! He's for display only, and is not to be eaten. 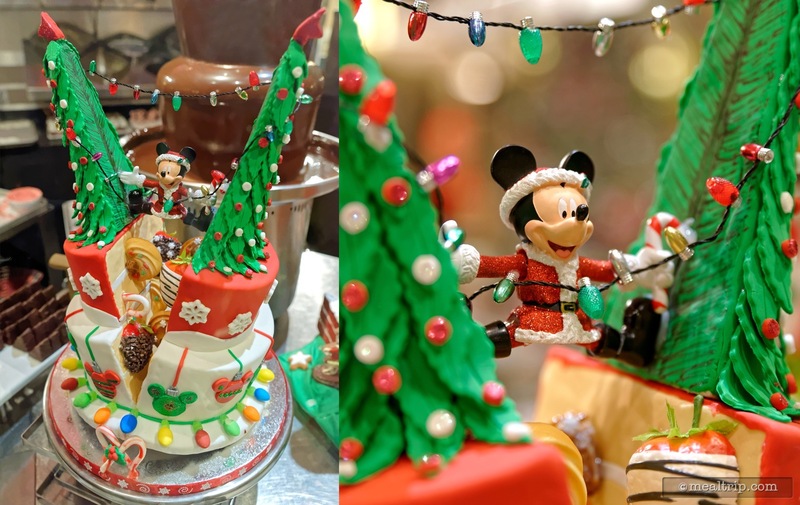 I think Mickey was trying to string the tree with lights, and somehow ended up slitting the cake centerpiece right down the center! I especially like that the cake seems to be filled with even more desserts! 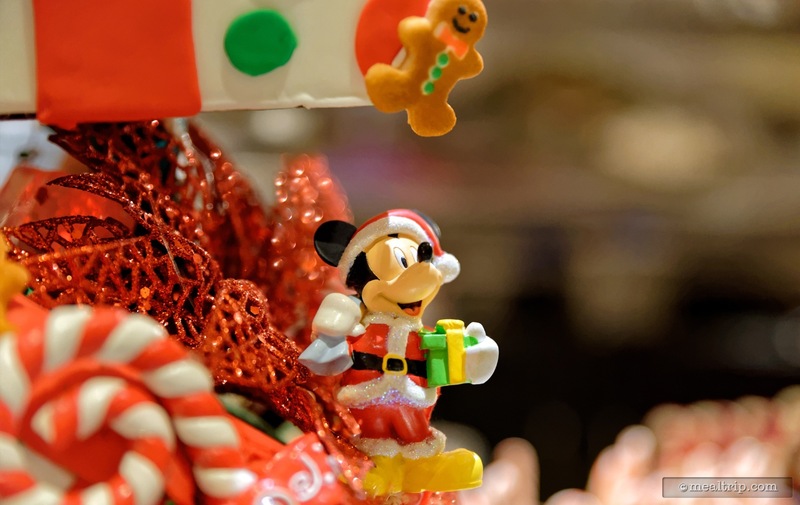 An almost microscopic gingerbread man hangs over the top of Mickey's head at the base of this dessert display. The "fab five" together at last... wishing you, and yours... a very merry, happy holiday!